Typhoon Soudelor’s heavy rains of more than 50 inches and major winds caused the highest potential for flooding, mudslides and other damage, already causing a landslide in at least one area of Taiwan, according to BBC. Numerous other tech companies in the Information and Communications Technology (ICT) space also reside in Taiwan. With ICT such a large revenue generator of Taiwan,6 supply chain risk is perhaps most relevant for suppliers and manufacturers in this space as a result of Typhoon Soudelor. To proactively prepare against disruptions to a company’s supply chain, such as factory fires, floods, other natural disasters or labor issues, businesses can analyze supply chain risks before they occur through global supply chain event monitoring. By utilizing solutions that monitor events posing potential supply chain risks before they happen, tech companies, for example, may not only better ward off scenarios such as that created by Typhoon Soudelor's ongoing damage, but also ensure an effective, real-time response plan. Multi-tier supply chain service disruptions—Not only do tech companies’ direct suppliers based in Taiwan face risks if impacted by Typhoon Soudelor, but so do any of their supply chain’s sub-tier suppliers, sub-contractors, and manufacturers located in the region. Without proper supply chain visibility and supply chain mapping, determining which companies’ sites and parts that will be impacted could require wasted hours or days of research. To address risks before they occur, tech companies should consider utilizing virtual war room functionality to ensure complete supply chain visibility and better analyze each supplier’s potential disruptions based on location. Potential for major supply chain bottlenecks—In the case of a disruptive event such as what we are beginning to see in the aftermath of Typhoon Soudelor, according to Bindiya Vakil, CEO of Resilinc, “Disruptive events can often create major supply chain bottlenecks which can cause widespread profit leakages for customers as inventory dries up and capacity shortages result in higher raw material prices. In these highly disruption allocation situations [such as what we might see with Typhoon Soudelor], no one in the supply chain can get adequate supply of the necessary raw materials or parts.” Especially in the high tech industry and with Taiwan’s high concentration of semiconductor fabs, competing with other companies for scarce resources is a likely outcome. Using a 24/7 global event monitoring service could be the edge a company needs to react quickly and decisively, leveraging real-time event detection and impact analysis. When hooked up to virtual war room functionality, this supports rapid mobilization of focused and coordinated crises response and recovery strategies and playbooks. Reputational risk—How a business mitigates risk and accounts for the actions taken by all parties within their multi-tier supply chain is critical to their brand and corporate profile. Hurricanes and typhoons are a large element of understanding that risk and how to account for it, as such natural disasters continue to rank in the top three types of supply chain disruptions. A sign that more businesses continue to understand the relevance of this is through the growth of Corporate Social Responsibility (CSR) reporting. A few of the measures businesses can take to ensure complete accountability of their supply chain can include using the right tools to address suppliers located in high-risk areas or collect information about suppliers to ensure they provide the necessary service a business needs. Proactively planning for risks can help companies’ better position themselves as leaders in ensuring complete supply chain visibility. The right solutions can help companies with multi-tier supply chains understand how supply chain risks impact not only their sites but product and revenue levels as well. Resilinc EventWatch is actively monitoring the situation and providing live updates to EventWatch subscribers, as more reports come in about the impact to Taiwan and makes landfall in China. Click below to learn more about the premiere supply chain event monitoring service. The Weather Channel LLC . Typhoon Soudelor Makes Landfall in Taiwan; 145-MPH Gust In Japan's Ryukyu Islands; More Than 4 Feet of Rain in Taiwan"
BBC. "Deadly Typhoon Soudelor Batters Taiwan"
CNN. 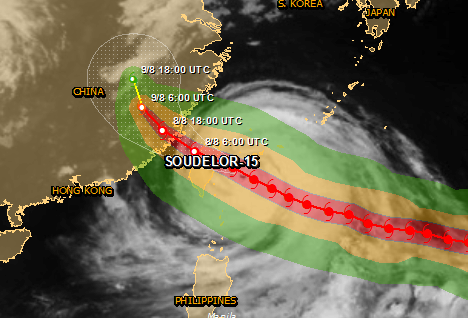 "Powerful Typhoon Soudelor Slams Into Taiwa "Typhoon Soudelor Impacts: At Least 6 Killed In Taiwan; Evacuations Ordered in China; Record-Breaking Power Outages Recorded"
The Weather Channel LLC. "Typhoon Soudelor Recap: 145-MPH Gust In Japan's Ryukyu Islands; More Than 50 Inches of Rain in Taiwan"
IC Insights. "Six Top 20 1Q15 Semiconductor Suppliers Show >20% Growth"
Forbes. "Taiwan's Technology Industry Marks Global Success"
Milpitas, CA – October 26, 2015. Hurricane Patricia – the strongest hurricane ever recorded in the western hemisphere – made landfall on the Pacific coast of Mexico on Friday, October 23rd around 6:15 p.m. local time. The supply chain impact, while still being assessed, clearly can be characterized as minor, especially when compared to relatively recent historic extreme weather events such as Hurricane’s Katrina and Sandy and other “acts of god’ such as the Japan Earthquake and Tsunami and the Thailand floods of 2011. It is nevertheless significant as it represents the first weather event with the potential to impact supply chains that can be definitively linked to the El Niño weather pattern. Resilinc, the leading cloud technology provider of supply chain risk management intelligence and analytics, has been warning its clients and the broader supply chain management professional community for months to take proactive mitigation actions in preparation for the impending El Niño. In a recent impact analysis white paper entitled El Niño: A Test of CPO Leadership and Your Supply Chain Resiliency Culture, Resilinc argues that El Niño is unique in that it is perhaps the only supply chain disruption phenomenon in which the general timing and geographic location of the potential impact is known well in advance, providing a unique opportunity to plan and prepare. It concludes that if executive leadership is blindsided by El Niño, they have no one else to blame but themselves. Although fears of a major catastrophe did not materialize, as there were no immediate reports of any deaths or damages to major infrastructure, the potential for supply chain impact from Hurricane Patricia for companies with significant supplier exposure in the western coast of Mexico (specifically the states of Nayarit, Colima and Jalisco), was daunting. The Pacific coast of Mexico is home to numerous automotive, high tech, life sciences, and other industrial manufacturing facilities, as well as port and freight operations. Key companies in the region include Flextronics, America Movil, Mexichem, Grupo Mexico, Pacific Coast Energy and Minerals LLC, and Ciudad Industrial Morelia. But, in the end supply chain impact appears limited to minor work operation disruptions from localized wind damage, floods, and mudslides impeding workforce transportation and the flow of goods in-and-out of southwestern Mexico. According to experts, the favorable outcome can be attributed to two factors: preparation and luck. As reported in the Sunday New York Times (“Mexico Exhales after Surviving a Giant Storm,” by Azam Ahmed and Paulina Villegas, October 15, 2015), the Mexican authorities learned some hard lessons from inadequate responses to earlier responses. 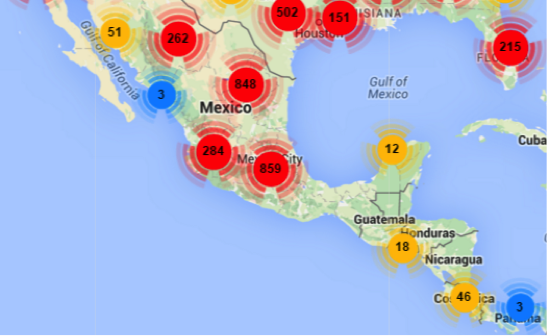 Mexico now has a national emergency response system that coordinates with authorities at the local level. Federal and local officials were effective in proactively moving people out of harm’s way, and after the storm responded quickly to clear roadways and begin to restore power and communication lines. Despite the effective planning, the impact still had the potential to be devastating if not for a lucky break. The path of the storm passed between two major cities, Puerto Vallarta and Manzanillo, but hit neither directly. It then quickly dissipated 12 hours after touching ground when it veered into a mountainous region. Milpitas, CA – February 2, 2016. Resilinc released online today its 2015 supply chain events annual report which summarizes and analyzes nearly 750 unique supply chain notifications and alerts generated by its EventWatch® 24X7 global event monitoring, alert, and analysis service. Supply chain risk management practitioners subscribe to the EventWatch service to receive early warnings and analysis of supply chain incidents that can negatively impact revenue, market share, customer satisfaction, and shareholder value. EventWatch is the only service of its kind that personalizes the EventWatch client’s potential impact at the supplier site and part levels to quantify the potential revenue at risk. The annual report analyzed incidents by risk type, industry, geography, severity, and seasonality and compared 2015 data in these categories with 2013 and 2014. The report also reveals The EventWatch Top 5™ supply chain events of 2015. The top 5 event ranking is driven by estimated aggregate revenue impact. This was calculated leveraging Resilinc’s database of over 80,000 suppliers and approximately 1.5 million parts which are tracked in its cloud supplier intelligence repository. The top 5 events were (1) Typhoon Soudelor and (2) Typhoon Dujuan which both hit Taiwan, China and the Philippines, (3) Tianjin explosions at the Port of Tianjin, China, (4) Typhoon Mujigae which affected China, Vietnam and the Philippines, and (5) Typhoon Goni which affected parts of Taiwan, China, Japan, Korea, and the Philippines. Information in the annual report provides estimates of revenue impact, average site time-to-recovery (TTR) and the number of sites affected. 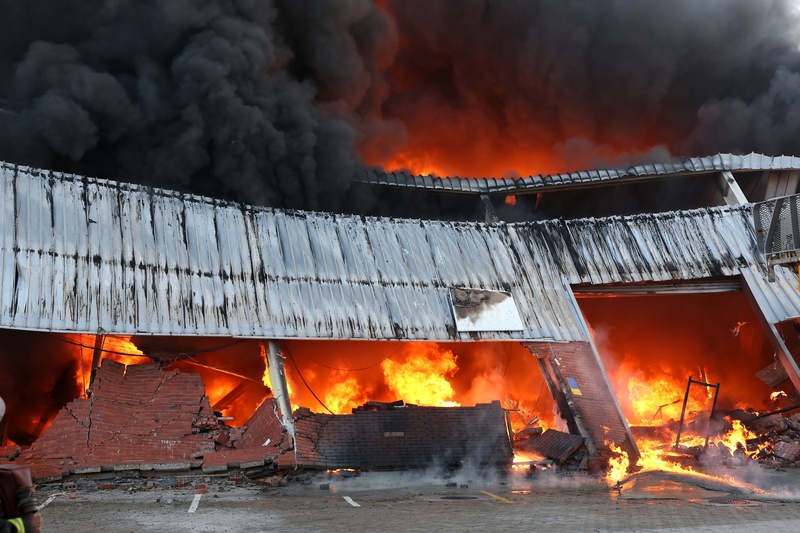 For a third year in a row, factory fires/explosions were the most commonly reported supply chain event and represented 17% of EventWatch bulletins in 2015. For a third year in a row, the automotive industry was the most frequently impacted industry tracked by the EventWatch service, but by a relatively narrow margin compared with reported incidents that impacted the high tech and life sciences industries. In 2015, the majority of supply chain events reported by EventWatch occurred in Asia, followed closely by North America. In 2014, the lion’s share of supply chain events emanated from North America. The EventWatch Annual Report aggregates, analyzes, and summarizes supply chain event information generated by the EventWatch® 24x7 global event monitoring, alert, and analysis service. EventWatch is the leading service of its kind and used by global corporations to improve their event responsiveness and crises preparedness. The EventWatch Annual Report is used by supply chain risk practitioners, analysts and executive stakeholders to understand global supply chain risk trends through a variety of lenses. It answers questions like: Which event types are most common or becoming more common? How does my industry compare to other industries in terms of the number of events experienced? Which regions are impacted the most? And, what months see the most incidents? Resilinc is the leading cloud provider of supply chain resilience and risk management intelligence and analytics. Industry leaders like Amgen, GM and EMC rely on Resilinc to mitigate risks end-to-end, while achieving long-term competitive advantage, and building brand and shareholder value. The Resilinc SCRM solution platform and services deliver the fastest time-to-value and the lowest resource Impact. It accomplishes this by providing the world’s largest repository of supplier and part intelligence leveraging the power of our “LinkedIn” supplier community; the most robust set of dashboard visualization and patent-pending analytic functionality for pro-active planning and risk quantification; and the only solution that personalizes your impact analysis by automatically connecting incidents with your supply chain map so you don’t have to.